I used to hear that frequently earlier in my career. Often from dads who brought their children in for an appointment. There are few things so motivating for a dad as knowing he will have to report the details of a visit to the doctor to mom when she gets home. So early on, I got into the habit of writing things down. And drawing pictures. After the visit is over, mom, dad, guardians and grandparents often think of something else they want to add, or ask. For several generations now, the phone has been the standard tool of communication after the office visit is over. At Quinte Pediatrics and Adolescent Medicine, we spend much time looking at the latest advances in technology, and how we can use them to improve care to our patients. Which brings us to our latest step forward: Wellx. 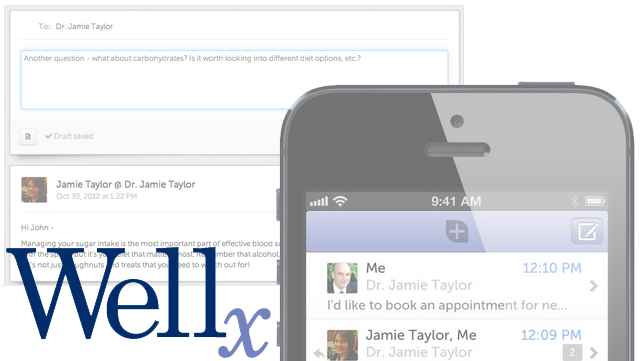 Wellx.ca is an online, secure portal that allows our patients to communicate back and forth with us after you’ve left the office. Here’s how it works. During our office visit, as we put together our plan of action near the end of the appointment, I list the steps of our plan on the Wellx portal. Then, we send you an invitation to Wellx via your email. The invitation that arrives in your inbox contains no confidential patient information, and does not even include the name of your child. It simply invites you to open a Wellx account, and choose your own password. When you do, you gain immediate access to our plan, and the ability to message back and forth to clarify details from the appointment. If your email is ever hacked, no patient identification or information is available to the hacker. The information we communicate on the Wellx portal becomes part of your child’s confidential medical record. All information shared on the Wellx portal is protected by industry-standard encryption and practices (think bank-level). Of course, you are not at all obligated to use Wellx, and we’re still happy to pull out paper and pen, or more commonly keyboard, tablet and printer. We think you’ll like this step forward, though, and many of our patients who are already using Wellx with us seem to love it. Especially dads. We’ll show you more next time you’re in the office.